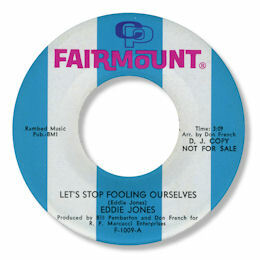 After a tasteful guitar introduction Eddie comes in clear and soulful on this delicious beat Ballad from New York. He shows some lovely gospel tricks throughout the well constructed Let's Stop Fooling Ourselves, as well as a terrific sense of timing with some super delayed phrases. And arranger/co-producer Don French has a deft touch with the strings which certainly add atmosphere. The flip is a reasonably strong uptempo tune which has had some dance plays. This 45 has been released twice, and the second issue is decidedly strange. 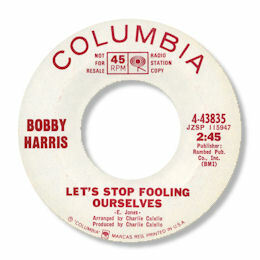 It was picked up by Columbia who released it under the name "Bobby Harris" with completely different credits. However it is clear from the first few bars that it isn't him at all but rather Eddie Jones. A detailed listen reveals that this version is slighly different from the Fairmount 45 and is - most probably - a different take. The flip to the Columbia 45 is sung by some white crooner I don't recognise. Was this all a mistake? Or was Bobby scheduled to recut the song? I simply don't know - does anybody?